U.S. citrus production in the 2018/19 marketing year (October�September) is rebounding from previous-year lows. The current citrus crop forecast of 8.02 million tons for 2018/19 is up 31 percent from the previous season, reflecting expected expanded national production across all major citrus commodities, excluding lemons, and overall larger crops in the four major producing States. 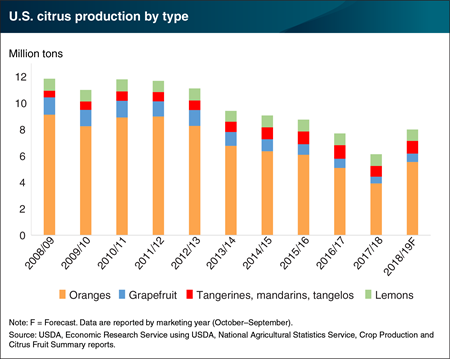 If the 2018/19 citrus production forecast is realized, it would be the first year since 2010/11 that production hasn�t declined. Expected increased 2018/19 supplies are lowering fresh citrus prices in the domestic market. This chart appears in the ERS Fruit and Tree Nut Outlook newsletter, released on March 29, 2019.